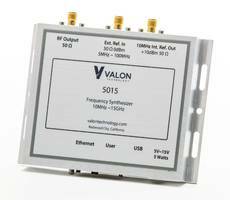 Valon 5015 Frequency Synthesizer Module is operated over a frequency range from 10 MHz to 15 GHz with input voltages of 5 to 15 V. Unit is suitable for wireless engineering, point-to-point microwave communications, electro-optics, molecular spectroscopy, particle physics and radio astronomy applications. Offering an external reference frequency from 10MHz to 120MHz, unit comes with USB, Ethernet, SPI and TTL Serial interfaces and delivers an output of more than 13dBm. Direct Digital Synthesizer ICs offer up to 64-bit resolution.